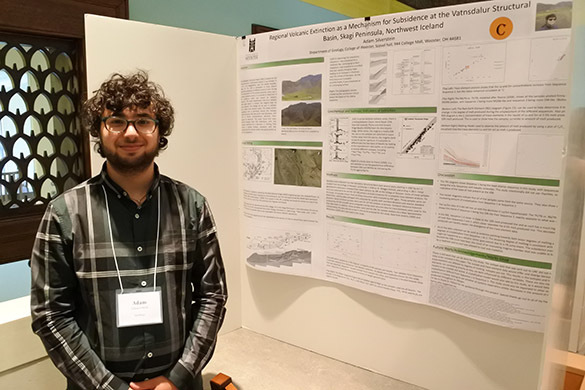 WOOSTER, OHIO–A dozen Wooster Geologists participated today in the annual Wooster Senior Research Symposium: A Celebration of Independent Study! All did superb presentations that were very well received. The geology portion began in the morning with talks from Team Utah 3.0, led by Dr. Meagen Pollock and Dr. Shelley Judge. 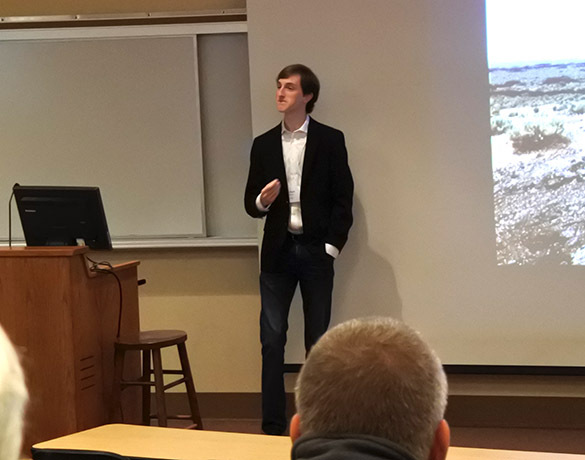 Michael Williams (’16) gave his talk entitled “Emplacement Processes and Monogenetic Classification of Ice Springs Volcanic Field, Central Utah”. Here’s a link to Michael’s field work. 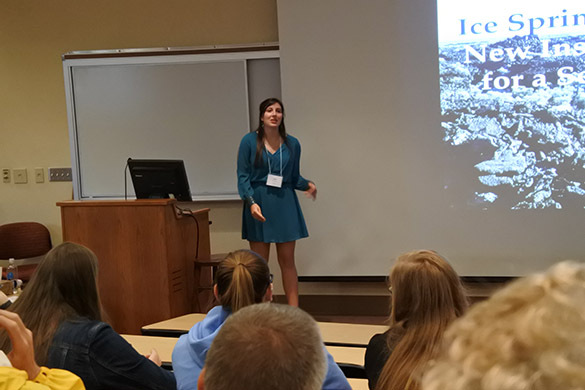 Kelli Baxstrom (’16) also spoke for Team Utah with her talk entitled: “Ice Springs Volcanic Field: New Insights and History for a Series of Complex Eruptions”. Here’s a link to Kelli’s field work. 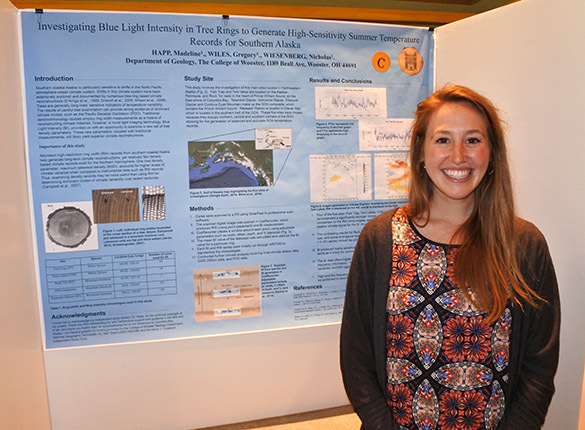 Maddie Happ (’16) had a poster entitled: “Investigating Blue Light Intensity in Tree Rings to Generate High-Sensitivity Summer Temperature Records for Southern Alaska”. Here’s a link to Maddie’s field work. 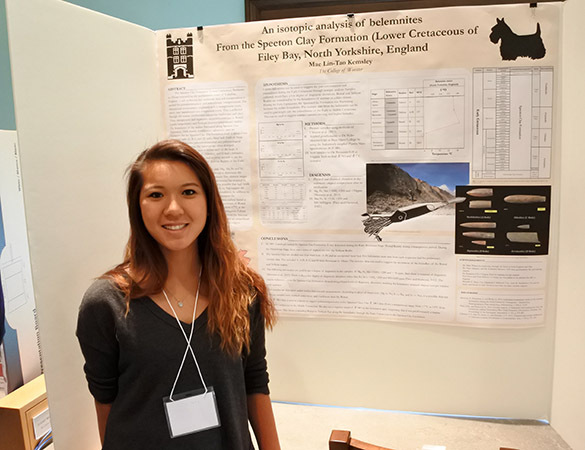 Mae Kemsley (’16) presented: “An isotopic analysis of belemnites from the Speeton Clay Formation (Lower Cretaceous) of Filey Bay, North Yorkshire, England”. Here’s a link to Mae’s field work. 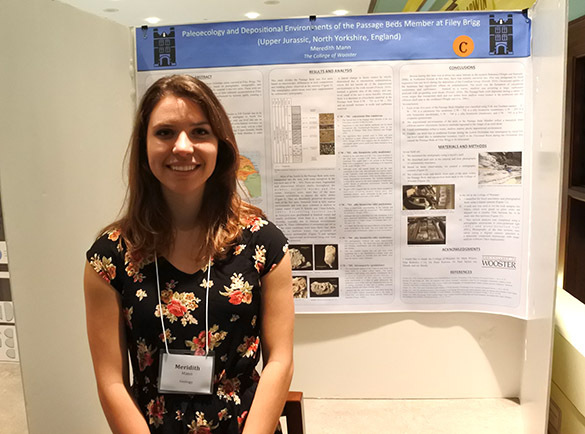 Meredith Mann (’16) gave a poster entitled: “Paleoecology and Depositional Environments of the Passage Beds Member at Filey Brigg (Upper Jurassic, North Yorkshire, England)”. 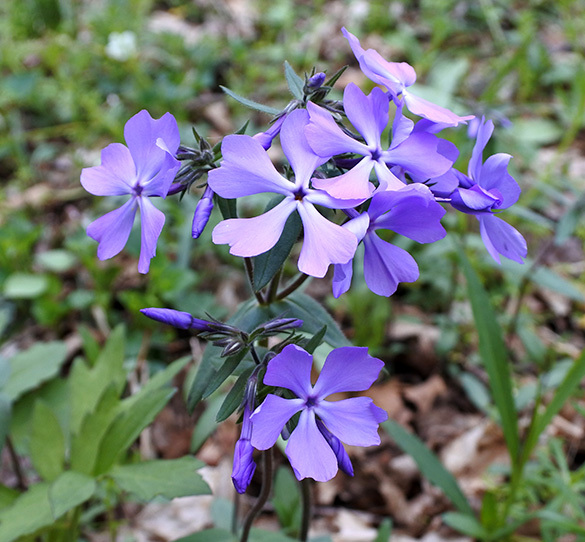 Here’s a link to Meredith’s field work. Dan Misinay (’16) presented: “Late Holocene Glacial History of Muir Inlet, Glacier Bay National Park and Preserve, Alaska”. Here’s a link to Dan’s field work. 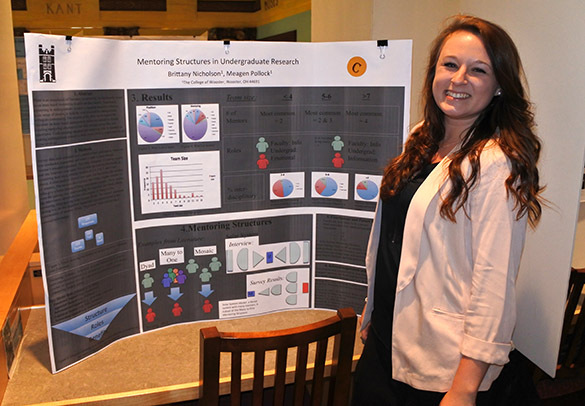 Brittany Nicholson (’16) gave a poster entitled: “Mentoring Structures in Undergraduate Research”. 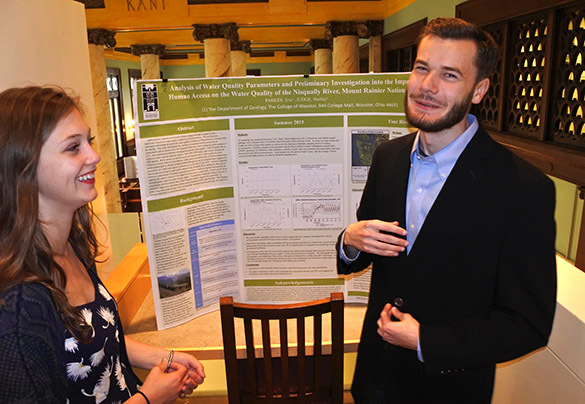 Eric Parker (’16) presented: “Analysis of Water Quality Parameters and Preliminary Investigation into the Impacts of Human Access on the Water Quality of the Nisqually River, Mount Rainier National Park”. 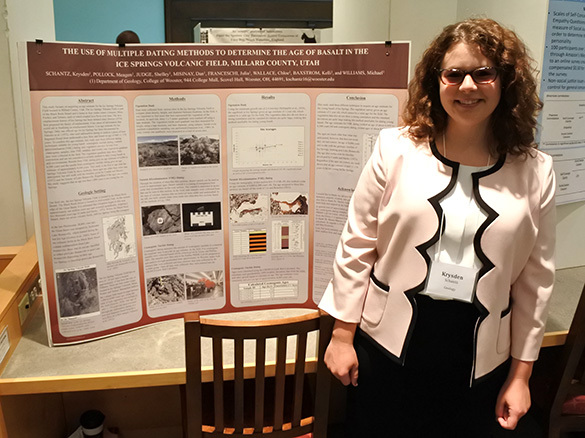 Krysden Schantz (’16) gave: “The Use of Multiple Dating Methods to Determine the Age of Basalt in the Ice Springs Volcanic Field, Millard County, Utah”. Here’s a link to Krysden’s field work. Adam Silverstein (’16) presented: “Regional Volcanic Extinction as a Mechanism for Subsidence in the Vatnsdalur Structural Basin, Skagi Peninsula, Northwest Iceland”. You can find Adam in Iceland in this post. 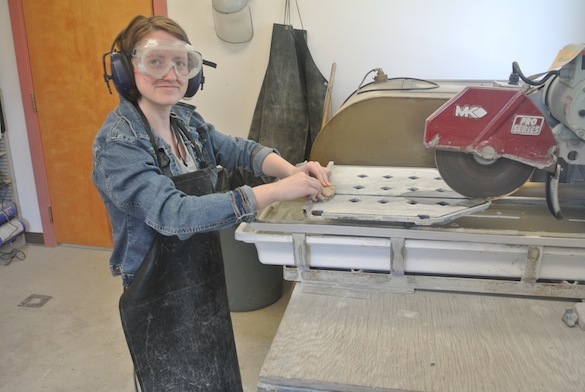 Kaitlin Starr (’16) is a double major in studio art and geology. Maybe we shouldn’t have been surprised to see her double-booked for the same time slot at the symposium. Her geology I.S. 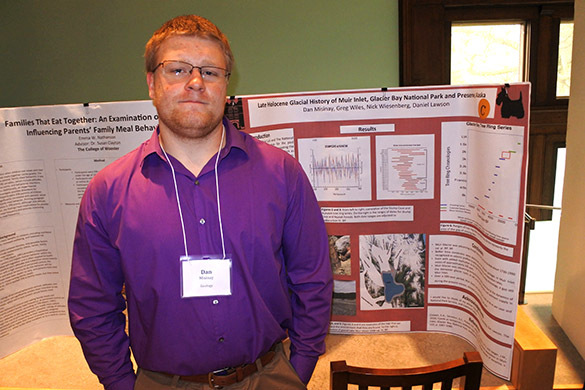 thesis poster was titled: “Reconstructing Glacial History from Forests Preserved in the Wake of the Catastrophic Retreating Columbia and Wooster Glaciers, Prince William Sound, Alaska”. Here’s a link to Kaitlin’s field work. 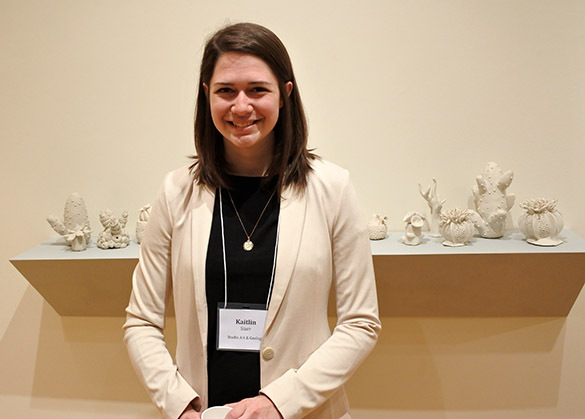 She is shown above with her art exhibit: “Exploring the Unknown: A Ceramic Journey Through the Sea of Imagination”. 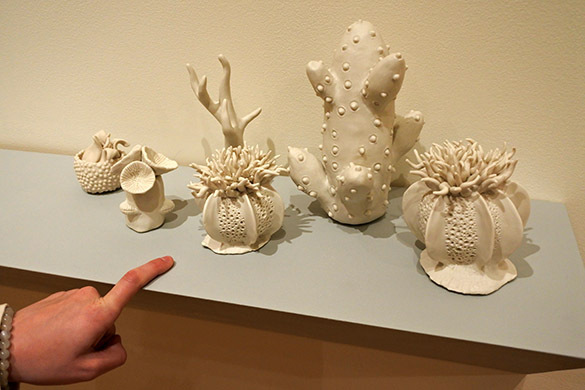 She made fantastical representations of marine creatures that do not exist but look eerily like beautiful fossils. I call them Kaitlin’s Kreations, and think they’re wonderful! Congratulations on your successful Independent Study projects, Wooster Seniors! 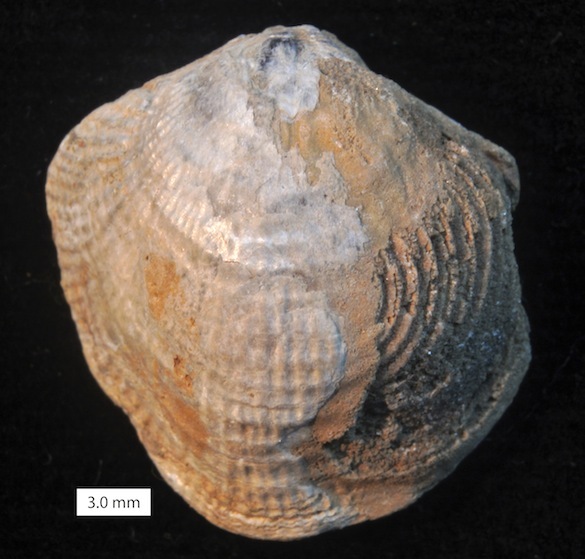 We have another beautiful brachiopod this week from our friend Mr. Clive Champion in England. He sent me a surprise package of fossils earlier this year. They are very much appreciated by me and my students! The specimen above is Cererithyris arkelli Almeras, 1970, from the Bathonian (Middle Jurassic) of Ranville, Calvados, France. (Ranville, by the way, was the first village liberated in France on D-Day.) 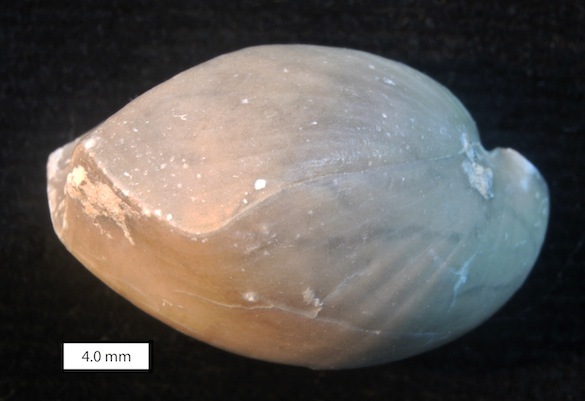 It is a terebratulid brachiopod, which we have seen before on this blog from the Miocene of Spain and the Triassic of Israel. They have the classic brachiopod form. The image above shows the dorsal valve with the posterior of the ventral valve housing the round hole for the fleshy stalk (pedicle) it had in life. This is a side view of C. arkelli. The dorsal valve is on the top; the ventral valve on the bottom. 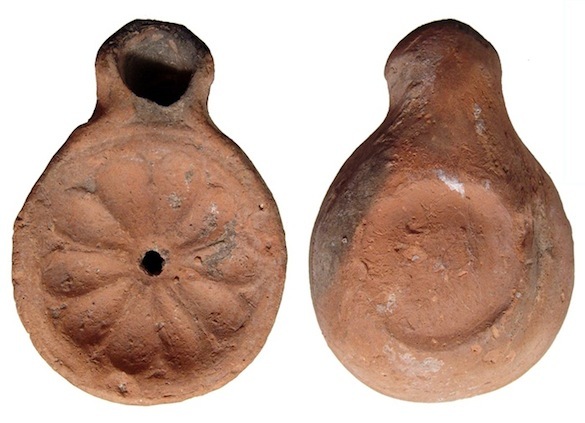 It is from this perspective that brachiopods were called “lamp shells” because they resemble Roman oil lamps. This is the ventral view of the specimen. These brachiopods are remarkably smooth. Cererithyris arkelli was named by Almeras (1970) in honor of William Joscelyn Arkell (1904–1958). Arkell was an English geologist who essentially became Dr. Jurassic during the middle part of the 20th Century. I’m shocked to see that with all his publications, awards and accomplishments, he died when he was only 54 years old. W.J. Arkell grew up in Wiltshire, the seventh child of a wealthy father (a partner in the family-owned Arkell’s Brewery) and artist mother (Laura Jane Arkell). He enjoyed nature as a child, winning essay contests on his observations of natural history in his native county and south on the Dorset coast. Arkell was unusually tall for his age (6 feet 4.5 inches by age 17.5 years in an unusually detailed note) and was considered to have “outgrown his strength”. 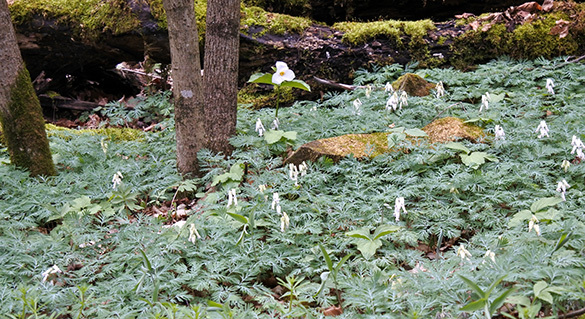 Nature and writing were escapes from athletic events. He also published poems. Arkell attended New College, Oxford University, intending to become an entomologist, but Julian Huxley was his tutor and he quickly adopted geology and paleontology. Eventually he earned a PhD at Oxford in 1928, concentrating his research on Corallian (Upper Jurassic) bivalves of England. As a side project, he published work on Paleolithic human skeletons from northern Egypt. Oxford suited Arkell, so he stayed there as a research fellow, expanding his research to the entire Jurassic System of Great Britain, then Europe, and then the world. His work became the standard for understanding Jurassic geology and paleontology for decades. 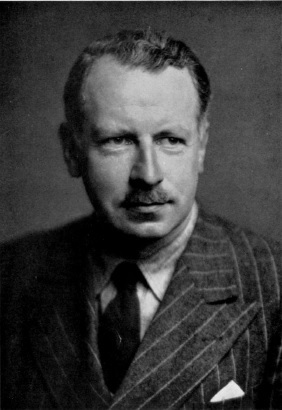 After World War II (in which he served in the Ministry of Transport), Arkell took a senior research position at Trinity College and the Sedgwick Museum, Cambridge University, continuing his work on the Jurassic. He travelled often, including long stints in the Middle East. His health was never good, though, and he had a stroke in 1956, and died after a second stroke in 1958. During his career Arkell received the Mary Clark Thompson Medal from the National Academy of Sciences in the USA, a Fellowship in the Royal Society, the Lyell Medal from the Geological Society of London, and the Leopold von Buch medal from the German Geological Society. Almeras, Y. 1970. Les Terebratulidae du Dogger dans le Mâconnais, le Mont dʼOr lyonnais et le Jura méridional. Étude systématique et biostratigraphique. Rapports avec la paléoécologie. Documents des Laboratoires de Géologie Lyon, 39, 3 vol. : 1-690. Arkell, W.J. 1956. Jurassic Geology of the World. New York; Edinburgh: Hafner Publishing Co; Oliver & Boyd; 806 pp. Cox, L.R. 1958. William Joscelyn Arkell 1904-1958. Biographical Memoirs of Fellows of the Royal Society 4: 1. Rousselle, L. and Chavanon, S. 1981. Le genre Cererithyris (Brachiopodes, Terebratulidae) dans le Bajocien supérieur et le Bathonien des Hauts-Plateaux du Maroc oriental. CR somm. Soc. Géol France, 1981: 89-92. Sedimentology & Stratigraphy class in Wooster Memorial Park. Watch this space! This morning Wooster’s Sedimentology & Stratigraphy class visited Wooster Memorial (“Spangler”) Park for some field experience. 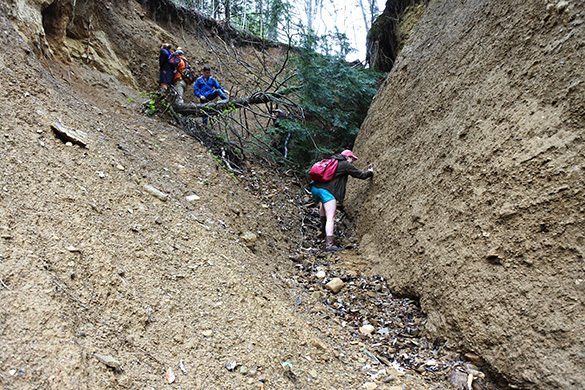 A few of the students are shown above exploring a magnificent glacial deposit. I never did get a photo with all 21 students in it. The students are each writing a blog entry about the geology of this park as a writing assignment. You can see the instructions and additional images on our course page. The best entry will soon be posted in this blog under the student’s name. Above is a nice stream-side outcrop of the Logan Formation (Lower Carboniferous). 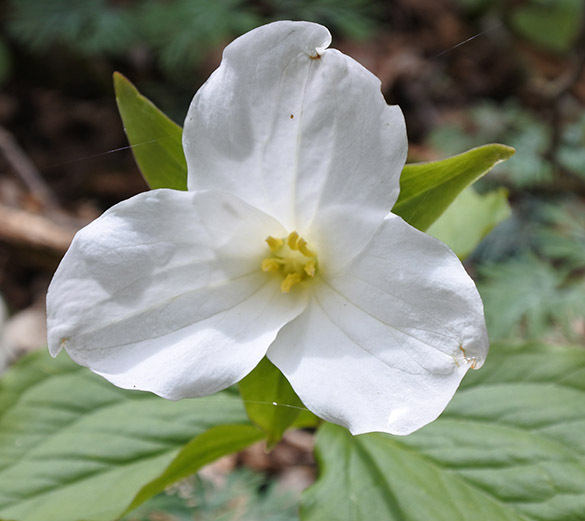 The most noteworthy flower this week is Trillium grandiflorum, a beautiful three-petaled white flower with six stamens. It doesn’t look like much, this long lump of gray stone. With a close view you might pick up a hint of a bryozoan or two, but mostly we see rather shabby shades of grey. One of the coolest perks of being a geologist, though, is that you get to use a saw to cut rocks in half to see what’s inside. So that’s what I did with this specimen from the Whitewater Formation (Upper Ordovician) of southeastern Indiana at a site we’ve visited often. In this cross-section we see first a long, cone-shaped fossil made of white calcite. 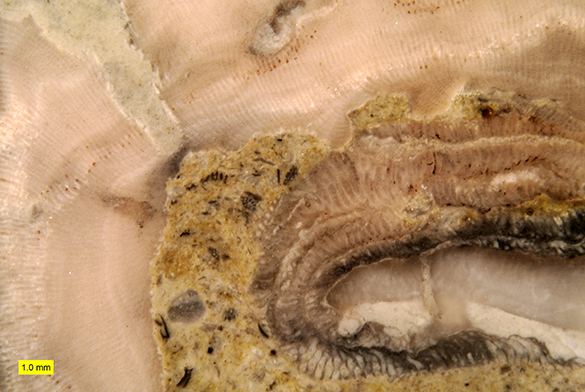 It is the rugose coral Grewingkia canadensis, one of the most common fossils in the upper part of the Upper Ordovician. This coral in life would have stood upright like an ice cream cone, spreading the tentacles of its polyp to catch very small swimming prey (and maybe to do a bit of symbiotic photosynthesis). The polyp sat in the cup-like cavity on the expanded end of the cone. The coral evidently died on the Ordovician seafloor and toppled over to be encrusted on one side, presumably the one that faced upwards. 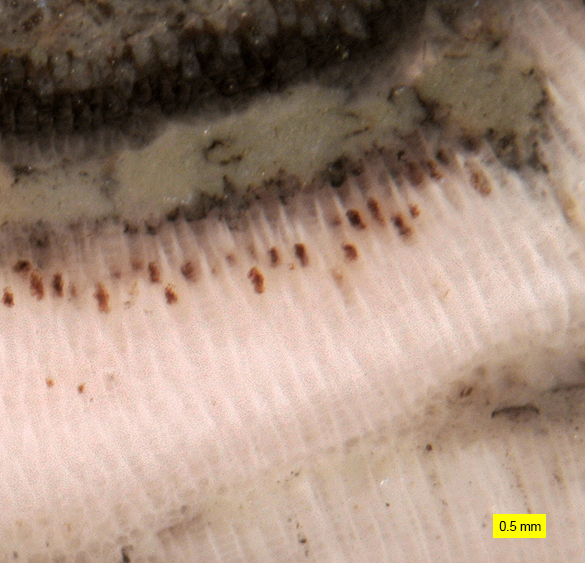 This is a closer view of the cross-section showing the encrustations on the rugose coral skeleton. The image is annotated below. The coral skeleton in the lower right was first encrusted by a trepostome bryozoan, which you can recognize by the tubes (zooecia) extending perpendicular from the substrate. This bryozoan is thickest on the upwards-facing surface of the coral, and it thins as it wraps around and then colonizes the cryptic space beneath (but not too far). This bryozoan is covered with a layer of sediment which appears to have rapidly cemented in place (a function of Calcite Sea geochemistry). The sediment then is encrusted by a another trepostome bryozoan with long zooecia and several layers. In this closer view of the second bryozoan you can see that its base is irregular as it grew across the rough cemented sediment surface. In the middle of this view some of the bryozoan zooecia are occupied by dark spots known as brown bodies. These are likely the remains of bryozoan polypides (main parts of the individual zooids) that were sealed into their zooecia by some disturbance. In this case the whitish bit of sediment above the cluster may represent something that settled on the colony, stopping the growth of the zooecia below, and forcing those nearby to grow around it. Moving down the coral skeleton away from its opening we come across borings drilled down through the coral skeleton (the white mass at the bottom of the image). 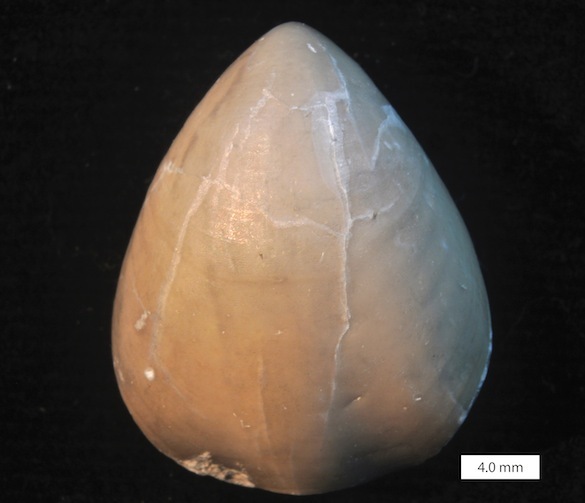 The conical, large boring is filled with golden crystals of the mineral dolomite, which were formed long after burial. The shape of this boring is unusual. Typical borings in these corals have straight parallel sides, but this boring is cone-shaped. We’ll see if we can find more like it to get a better idea of its shape and distribution. This week’s fossil, then, is a demonstration of the hidden wonders sometimes found in even the dullest of grey rocks! 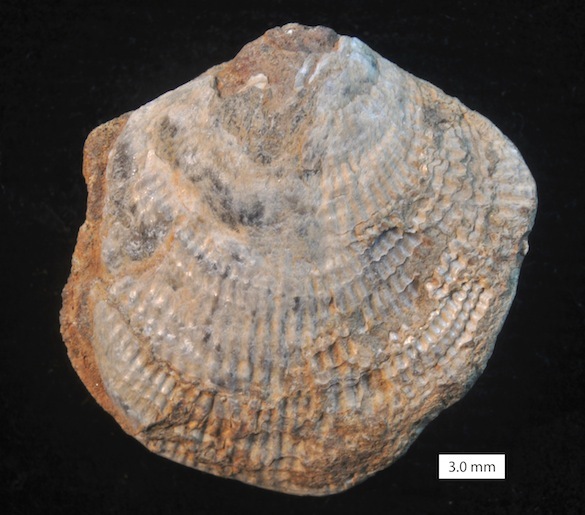 Our featured fossil this week is another gift from brachiopod enthusiast Clive Champion of England. This fine specimen of Atrypa sp. was collected from the Middle Devonian (Lower Couvinian) exposed at El Pical, Leon, Spain. Atrypa is the emblematic genus of the atrypid brachiopods, which were common in the Devonian around the world. They were also prominent in the Late Ordovician of the Cincinnati region, as seen here and here. We are looking at the dorsal valve in the above view. This particular specimen is not notable for its special beauty (it is, after all, exfoliated and a bit misshapen), but for the view it provides of an internal feature: the spiral brachidium, sometimes called the spiralia. This was a ribbon of calcite that supported the lophophore, a tentacular apparatus used in filter-feeding. We see it here because the dorsal valve eroded away, exposing the inside of the shell. Our friends at The Falls of the Ohio have another specimen showing the spiral lophophore of an atrypid. 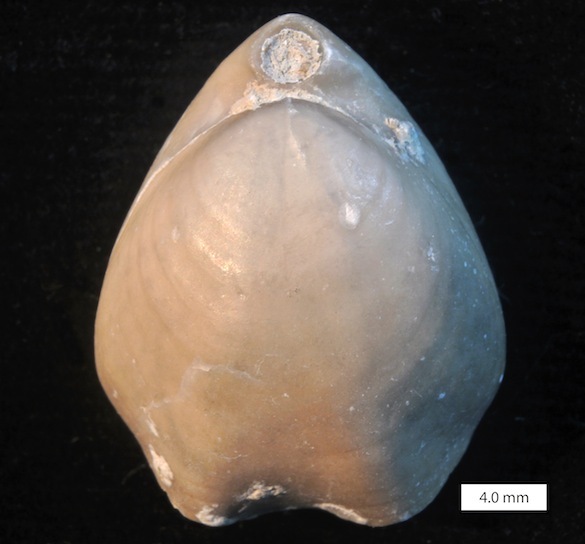 This is a view of the flat ventral valve of our atrypid brachiopod. Inside during life the spiral lophophore would have looked like two springs perpendicular to the floor of this valve. Thank you again, Clive, for the beautiful and inspiring brachiopods! Bose, R. 2013. A geometric morphometric approach in assessing paleontological problems in atrypid taxonomy, phylogeny, evolution and ecology, p. 1-9. In: Biodiversity and Evolutionary Ecology of Extinct Organisms. Springer, Berlin and Heidelberg. Rudwick, M.J.S. 1960. The feeding mechanisms of spire-bearing fossil brachiopods. Geological Magazine 97: 369-383. WOOSTER, OHIO–It was our pleasure to host Dr. Patrick O’Connor of Ohio University, who presented the 35th Annual Richard G. Osgood, Jr., Memorial Lecture. The Osgood Lectureship was endowed in 1981 by the three sons of Dr. Osgood in memory of their father, who was an internationally known paleontologist at Wooster from 1967 to 1981. We have had outstanding speakers through this lectureship, and Dr. O’Connor was one of the best. 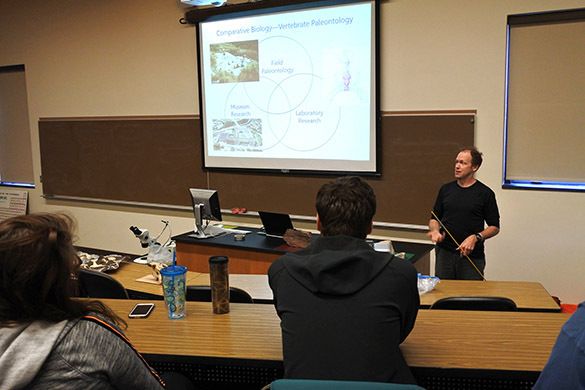 He gave his public lecture last evening (“Cretaceous Terrestrial Vertebrates from Gondwana: Insights from Eastern Africa and Madagascar”) and then a more detailed presentation to our Geology Club this morning (shown in the image above). We all learned a great deal, and Dr. O’Connor was especially good at asking our students questions. In Geology Club today Dr. O’Connor brought casts of fossils (like the above Maastrichtian theropod from Madagascar) and actual fossils (like the Maastrichtian bird bones from Madagascar shown below). We very much appreciated Dr. O’Connor’s diverse scientific skills and accomplishments, along with his enthusiasm and good humor. This is exactly what the Osgood Lectureship is about. The Biology Department at The College of Wooster is in the midst of a massive move in advance of the construction of the new Ruth Williams Hall of Life Science. The staff has been combing through old specimen collections, giving away items they don’t need for teaching or research. Among the objects are occasional fossils they gave to the Geology Department. 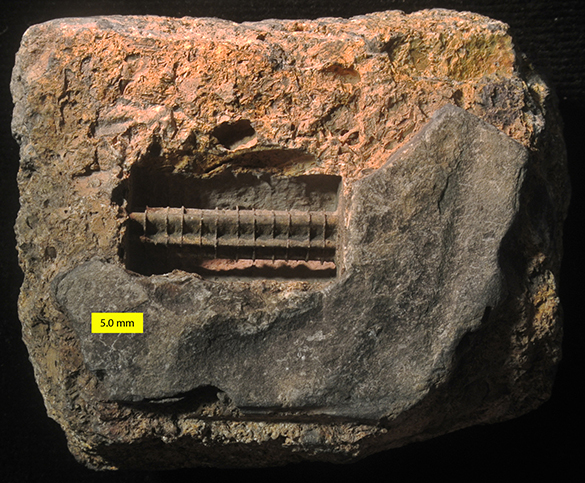 The above specimen is one of the most curious: a combination internal and external mold of a crinoid stem from the local Lower Carboniferous rocks. This is a closer view of the fossil. It is a cylindrical cavity with faint rings in a regular distribution. (These are external molds of the individual crinoid columnals.) Suspended down the axis is a segmented pillar with a stellate cross-section. (This is the internal mold of the crinoid stem lumen, a central cavity that runs down the center of the stem.) It appears that an iron-rich cement (probably siderite) filled this lumen after the death of the crinoid. The stem fragment was enveloped in a siderite concretion and the calcite stem columnals dissolved away. This leaves us with both an external mold of the stem and an internal mold of its lumen. For comparison, this is a crinoid stem fragment in its original calcite. It was found in a local Carboniferous limestone. Here are cross-sections of the same stems showing sediment-filled stellate lumens in their centers. 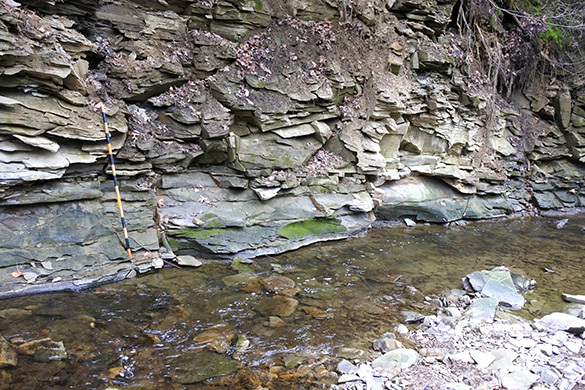 Last week we looked at a dull gray rock found in a roadcut in southeastern Indiana near the town of Liberty. It is from the Saluda Formation (Upper Ordovician), a thin unit that was likely deposited in very shallow, lagoonal waters along the Cincinnati Arch. 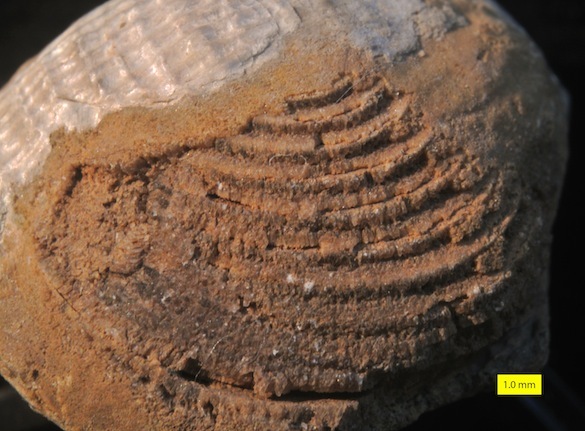 We know that it is primarily a platter formed by the mysterious fossil Tetradium, and that it is encrusted with a trepostome bryozoan that was infested by some sort of soft-bodied encruster on its surface, forming the trace fossil Catellocaula vallata. Now we’re examining the wonders revealed by cutting this rock in half. Above we see the surprising and spectacular geode that it is, with calcite crystals surrounding a dark cavity. Let’s see what the fossils look like when polished and magnified. The orangish, irregular patch in the lower half of the section above is the crystalline calcite near the center of the rock. 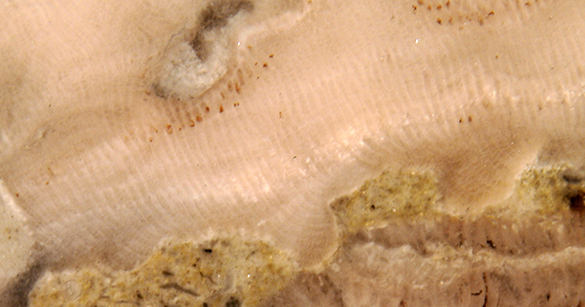 The sediment-filled tubes in the top half are of the Tetradium specimen. 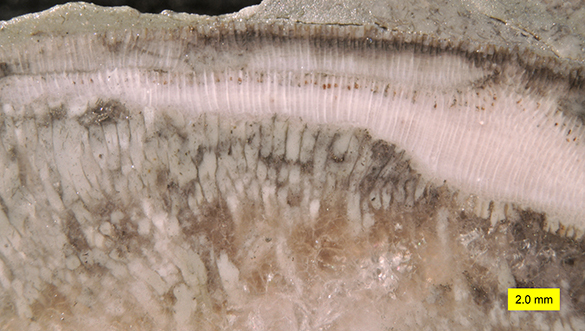 Note that the walls of the tubes are blurry and indistinct, and that they fade and disappear into the calcite crystals below. This is apparently because the skeleton of Tetradium was made of aragonite, an unstable form of calcium carbonate. 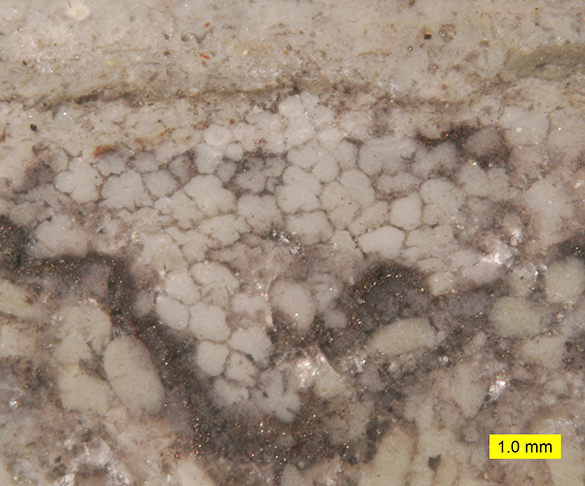 It is likely that the aragonitc, tubular skeleton of Tetradium dissolved away in the center of this encrusted mass, forming the cavity that later filled with secondary calcite crystals. The remaining tubes were apparently preserved as ghostly molds by infillings of calcitic mud that didn’t dissolve. In this section we are cutting the Tetradium tubes perpendicularly, rather than the longitudinal cuts we saw before. The cross-sections of the tubes show a four-part symmetry, which adds to the mystery of this group. (This is where the name “Tetradium” comes from.) It has been called a chaetetid sponge (as in Termier and Termier, 1980); a “calcareous filamentous florideophyte [red] alga” (Steele-Petrovich 2009a, 2009b, 2011; she renamed it Prismostylus), and most commonly a coral of some sort (as in Wendt, 1989). I now know enough about chaetetids to say that it is not in that group. Chaetetid tubes are not aragonitic, do not show tetrameral symmetry, and have diaphragms (horizontal floors). The corals of the Ordovician are decidedly calcitic, not aragonitic, and they too have internal features in their tubes not seen here. The four-part symmetry, though, is something you see in the coral’s phylum, Cnidaria, so there is that vague resemblance. The red algal affinity strongly urged by Steele-Petrovich may be our best diagnosis for the place of Tetradium. 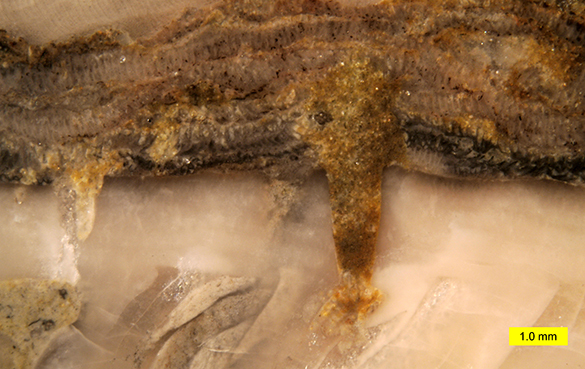 On top of the tubes of Tetradium is the encrusting trepostome bryozoan. 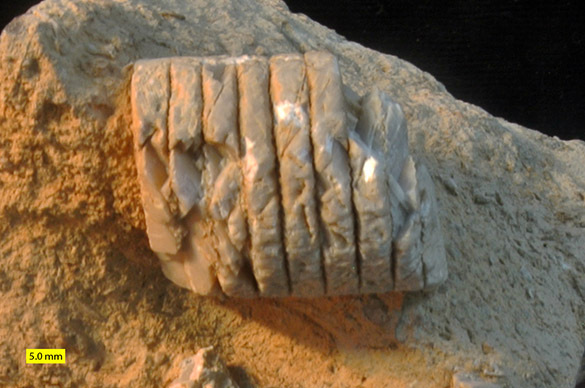 Its tubes (zooecia) are made of stable calcite, so they are well preserved compared to the aragonite tubes of Tetradium below it. 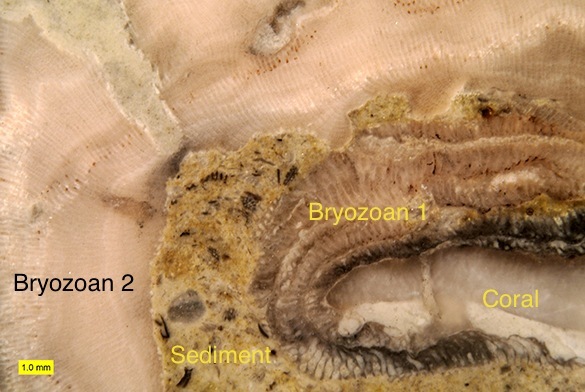 Note that the bryozoan is made of two layers. One colony died or went into some sort of remission, and another of the same species grew across it. The second colony could have budded somewhere from the first colony. 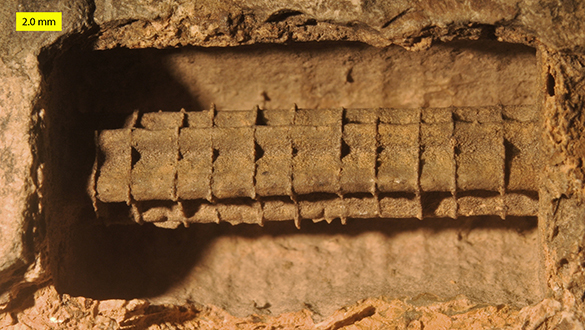 This closer view of the bryozoan section shows details of the zooecia, including the horizontal diaphragms inside. 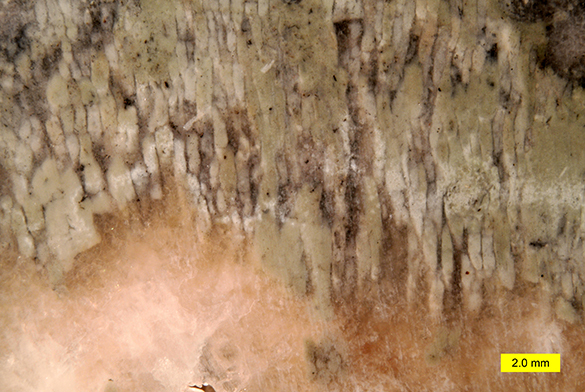 The dark spots at the tops of the zooecia are brown bodies, the remains of polypides preserved here in clear calcite cement. (We’ve seen brown bodies before in this blog.) They likely represent some sort of traumatic event in the life of this bryozoan when this part of the colony essentially shut down and was covered with sediment. Finally, there is a mineralogy story here too! 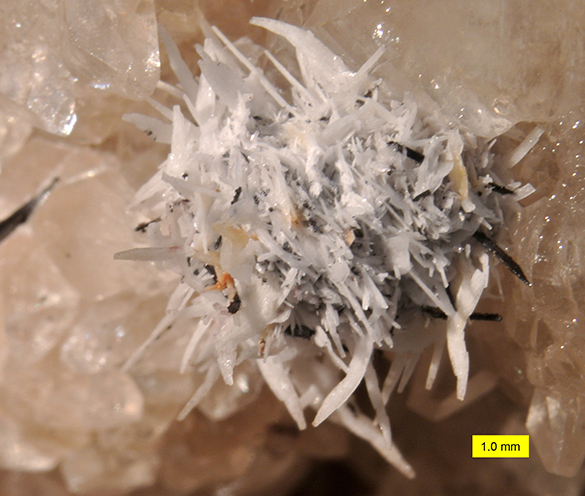 Attached to the dog-tooth calcite spar in the center of this geode is this tiny gypsum flower. The gypsum crystals are white and very delicate. The dark needles among them are mysterious. Dr. Meagen Pollock and her students will subject them to x-ray diffraction in her lab later this semester. I’ll report the results here. It is a simple tool, the rock saw. For geologists and paleontologists, it is one of our essential instruments for discovery. Hatfield, C.B. 1968. Stratigraphy and paleoecology of the Saluda Formation (Cincinnatian) in Indiana, Ohio, and Kentucky. Geological Society of America Special Papers 95: 1-30. Li, Q., Li, Y. and Kiessling, W. 2015. The first sphinctozoan-bearing reef from an Ordovician back-arc basin. Facies 61: 1-9. Palmer, T.J. and Wilson, M.A. 1988. Parasitism of Ordovician bryozoans and the origin of pseudoborings. Palaeontology 31: 939-949. Steele‐Petrovich, H M. 2009a. The biological reconstruction of Tetradium Dana, 1846. Lethaia 42: 297-311. Steele‐Petrovich, H M. 2009b. Biological affinity, phenotypic variation and palaeoecology of Tetradium Dana, 1846. Lethaia 42: 383-392. Steele-Petrovich, H.M. 2011. Replacement name for Tetradium DANA, 1846. Journal of Paleontology 85: 802–803. Termier, G. and Termier, H. 1980. Functional morphology and systematic position of tabulatomorphs. Acta Palaeontologica Polonica 25: 419-428. Wendt, J. 1989. Tetradiidae — first evidence of aragonitic mineralogy in tabulate corals. Paläontologische Zeitschrift 63: 177–181.